All Perfect Pets services include complete care for your pets. Our team of professional pet care specialists attend to your fur family’s every need. Each service visit includes walks, play, feeding, fresh water, brushing, waste removal, administering medicines, and lots of love and companionship. Your pet is our #1 priority. You can enjoy peace of mind knowing that your fur family is in good hands with Perfect Pets. We will come to your home for a “get acquainted” meet and greet with you and your pet prior to beginning your service. This meeting is essential for everyone, especially your pet, to get to know each other prior to our first visit. We will review your Pet Registration, discuss specifics of any medications, dietary or special needs, learn locations of food, treats, toys, etc. A $5 fee will be assessed if only one key is provided. The Initial Consultation is required for all new clients. Exercise is the single most important factor in keeping your dog healthy, happy and well-behaved. Our Weekly Dog Walk is the most popular service among our clients. Includes one midday walk Monday-Friday, fresh water, play and companionship. A walked dog is a healthy and balanced dog. Sometimes life doesn’t allow time to walk the dog. 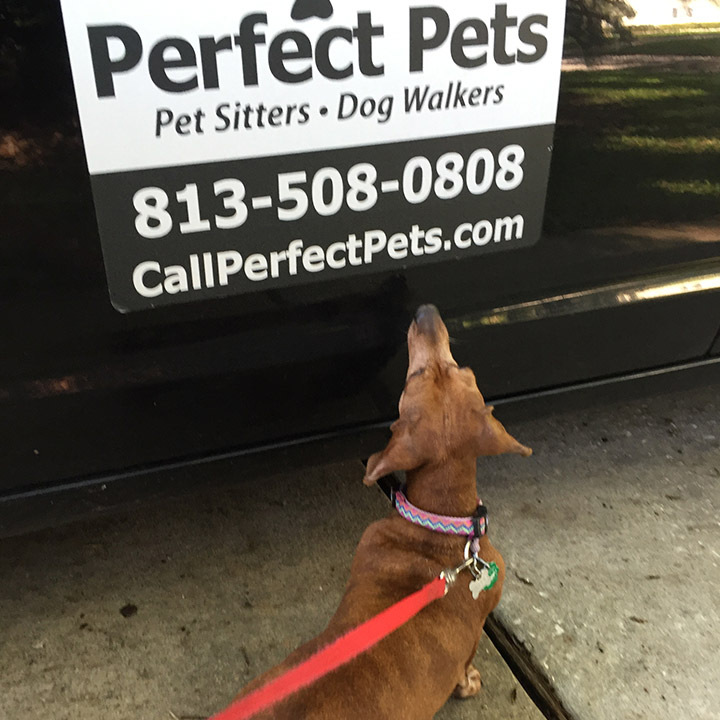 On any occasion, call Perfect Pets and come home to a happy pet. We will care for your pet each day with a minimum of 3 visits per day. You can enjoy a worry-free trip knowing your pet is exercising and enjoying their regular routine in the comfort of your home environment. Walks, feeding, fresh water, play and companionship. Vacation service also includes all of the extras of our house sitting service. If your cat could talk, they would tell you to call Perfect Pets. Studies show that cats get heightened anxiety being left alone for long periods or taken out of their environment for any reason. Each visit includes complete care for your cat, providing food, fresh water, fresh litter scooping or changing, and of course, lots of TLC! Just for Cats also includes all of the extras of our house sitting service. All rates include up to 2 pets per household. An additional charge of $5 per pet, per visit, for 3 or more pets. We require two copies of keys supplied by client at consultation. Key copies are billed at $5 each. If we have to schedule a pickup or drop off for keys, there is a $20 per trip fee. Cancellation Policy: We require 48 hours notice to cancel a scheduled service. $10 or 25% of total service charge, whichever is greater, applies if canceled within 48 hours of first scheduled visit. Rates are subject to change & may vary based on your location and/or care needs. Hours of Operation: Mon-Fri: 6:30a.m.- 6:30p.m. & Saturday: 9:00a.m. - 5:00p.m. Web Design & SEO by Archi FX Inc. This website was proudly built with by Archi FX LLC. All images are property of Perfect Pets. All rights reserved.